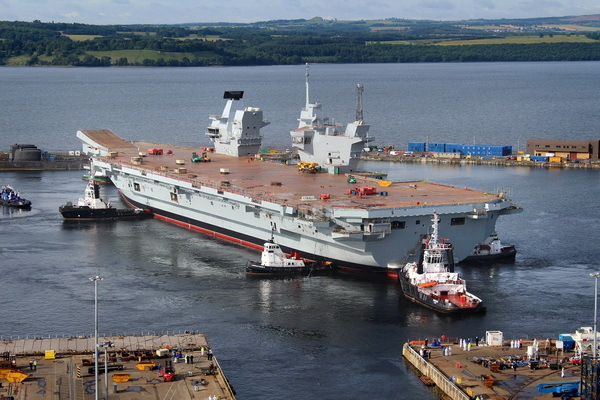 The aircraft carrier Queen Elizabeth, officially included on Dec. 7 in the Royal Navy of Great Britain, found a leak in the seal of one of the mechanisms. The Guardian writes about this. “The problem with shaft compaction was revealed during the maritime tests of Queen Elizabeth. Its elimination is planned during the parking in Portsmouth, “the Navy spokesman said. The aircraft carrier Queen Elizabeth cost 3.1 billion pounds (4.1 billion dollars) for the first time at sea on June 26, 2017. In 2018, the ship will be tested shipborne helicopters. Then Queen Elizabeth will make a transition to the eastern coast of the United States, where it will begin testing with the short-take-off and vertical landing fighter F-35B. The ship has a displacement of 65 thousand tons, its length is 282.9 meters, width – 75 meters. On its deck can accommodate up to 40 aircraft.